By HOOKS 4U: Merry Christmas!! Merry Christmas!! My trees are up and I am working on a different type of tree..hoping to get it finished up before Christmas. It is a bigger project than I thought.. Not much going on here, which is a good thing..Enjoy and May you always find the joy in whatever life throws your way. Merry Christmas. 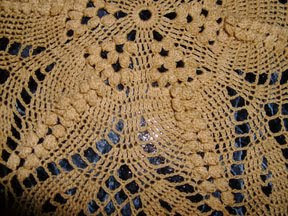 Where would I find the pattern to your beautiful crochet under the tree? It's gorgeous! Merry Christmas!